Here is something to frame and hang on your wall nearby where you can glance at it now and then. This excerpt is taken from the Address to the brethren given very close to the end of the installation of the officers of a lodge according to the “English” or British Columbia “Canadian Work” It comes from the Masonic Publication “The Educator” but seems to be an adaptation of an original piece of work, The Ideal of a Freemason written by Brother Otto Klotz in the mid 1800s. According to Cal Christie the piece The Ideal of a Freemason was written by Bro. Otto Klotz and incorporated into the General Charge at Installation of Lodge Officers in the Ontario working. “Born in Kiel, Holstein Germany, brewer and hotelier, Otto Klotz, immigrated to Preston, Ontario in 1837. Within a year, he was elected to the Board of School Trustees where he served as secretary-treasurer, almost without break, from 1839 to 1891. In 1845 Preston’s school became Ontario’s first “Free” school. He also served as Chief Engineer of the Preston Fire Brigade in 1850, Justice of the Peace in 1856, and, among other offices, was the President and long time director of the Waterloo County Agricultural Society. Highly regarded by Ontario Freemasons, Klotz was made an Honourary Past Grand Master in 1885. 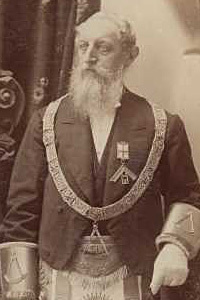 Excerpts from an article he wrote, published in The Canadian Craftsman on 15 March 1868, entitled The History of Freemasonry have been incorporated into the ritual of most lodges in Canada as The Ideal of a Freemason. Another great post Brother. Keep up the good work out there in Texas.